(CNN) -- The bodies of five U.S. servicemen fatally shot by a comrade at a stress clinic in Iraq were returned to the United States late Wednesday. 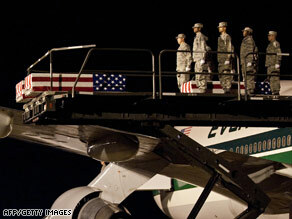 The body of one of the servicemen shot dead by a fellow soldier in Iraq arrives at Dover Air Force Base. Adm. Mike Mullen, chairman of the Joint Chiefs of Staff, met the bodies -- contained in flag-draped cases -- when they arrived at Dover Air Force Base in Delaware. Family members of three of those killed permitted photographers to document the return of their loved ones. They were Army Maj. Matthew P. Houseal, 54, of Amarillo, Texas; Army Sgt. Christian E. Bueno-Galdos, 25, of Paterson, New Jersey; and Army Private First Class Michael E. Yates, 19, of Federalsburg, Maryland. The two victims not photographed were Navy Cmdr. Charles K. Springle, 52, of Wilmington, North Carolina, and Army Spc. Jacob D. Barton, 20, of Lenox, Missouri. "I feel for him, but at the same time I am very angry at him," Shawna Machlinski said. Russell has been charged with five counts of murder in the shootings at Camp Liberty, near Baghdad's international airport. He was leaving the stress clinic Monday when he "became hostile and an altercation broke out," a senior Defense Department official said. Russell was then escorted back to his quarters by another soldier, said the official, who has read the most recent summary of the investigation in Baghdad. A couple of hours later, Russell seized a weapon from a fellow soldier, commandeered a vehicle and returned to the clinic, the Defense official said. A soldier from Russell's quarters called military police, but they couldn't stop him in time. The military has launched a criminal investigation into the attack and another query into the military's mental health services and prevention of similar incidents.